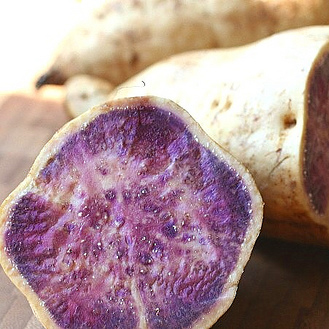 Did you know that Okinawan sweet potatoes were recently highlighted by Dr. Oz as being one of the top Superfoods of 2010?1 This vibrantly purple sweet potato, a locally grown staple of Hawaiian cuisine, is rich in flavor and packed with nutritional benefits. With Okinawan sweet potatoes in abundance this time of year, they make the perfect addition to your Thanksgiving meal. Peel the Okinawan sweet potatoes and chop into 1 inch cubes. Boil potatoes for 30 minutes or until soft (will turn dark purple), then drain. Mash the purple potatoes while adding in coconut milk and cinnamon powder to taste. Add sea salt to taste if desired.